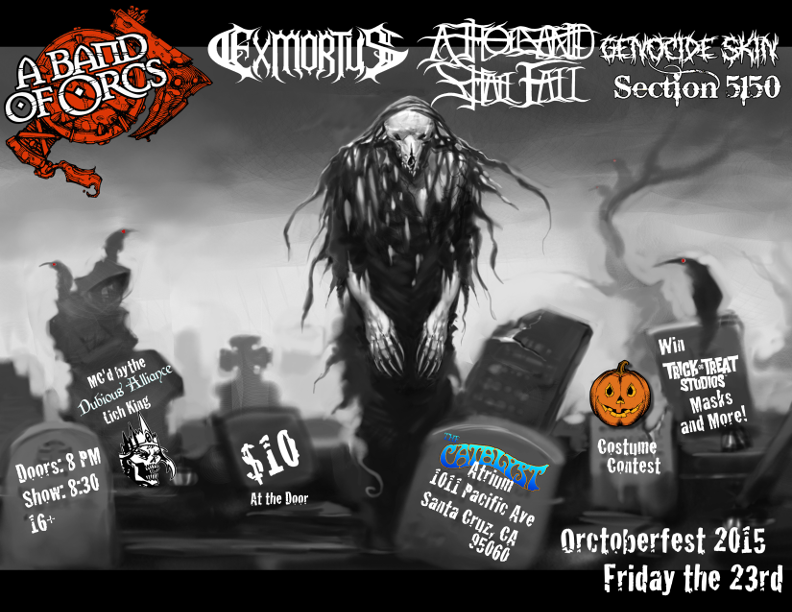 Santa Cruz, California’s most metal Halloween show returns this year with Orctoberfest 2015 on Friday, Orctober 23rd at 8 PM in the Catalyst Atrium featuring A Band of Orcs and their shredding human co-headliners Prosthetic Records’ Exmortus. A Band of Orcs performance will feature their new line up with Gronk! Shaman on high scream vocals and Cretos Filthgrinder on shredding guitars and gutteral growls. Oog Skullbasher will continue driving the war machine with his tribal beat downs and the latest adition to the band, Srig Foehammer on bass, will take the stage with the Orcs for the second time. Be prepared for new material from the Orcs’ yet-to-be-named forthcoming concept album about transdimensional-mind-fcking-demon-spiders-from the Abyss, due out in the first quarter of 2016 as well as their March of the Gore-Stained Axe Tribe EP that came out earlier this year and selected material from their earlier releases. Coming fresh off their tour with Marty Friedman expect Exmortus to be ready to party like oRcstars with their twin Axe attack and boundless energy! Also adding to the festivities will be Santa Cruz local powerhouses A Thousand Shall Fall; Oakland’s Genocide Skin, featuring members of Cyanic and Ghoul; and San Jose bludgeoners Section 5150. Orctoberfest will be MC’d by none other than the Lich King himself from the latest Dubious Alliance expansion set Lair of the Lich King. He appeared earlier this year at the KublaCon game convention and caused no end of trouble for Gronk! and Oog, but he’s not dead yet, so we figure if you can’t beat ‘em make ‘em join you! All you budding horror and fantasy make up and FX artists better bring you’re a-Game. Trick or Treat Studios will be sponsoring a “Most Metal Costume Contest” judged by owner Chris Zephro and their world renowned VP of Art Direction Justin Marby, whose designs are featured on almost every costume store in America’s shelves. Prizes will include Trick or Treat Studios officially licensed Motorhead “Warpig” Mask and many other from their horrific line of latex faces. Visit their website to see all the killer designs they have at http://www.trickortreatstudios.com. If you arrive at doors then you may be able to catch a Dubious Alliance Fantasy Bluffing Card Game with the designer himself Brandon Raasch, or one of his minions. The show is 16 and up, so put your most metal costume on, stuff your kids in the trunk, get your tusks up, and come ready to battle in the pit. Hail Gzoroth!!!! Brought to you by Grimpire Entertainment. Did you miss us, humans? We’re back from Hirntodia! We’ll be performing our first raid since the Madness at the Core of Time Tour in 2013. 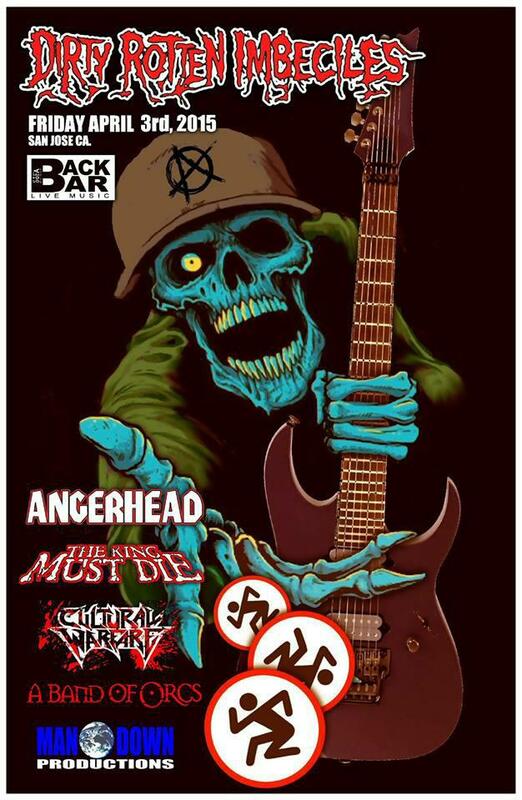 This time we tear up the stage with the legendary thrash-punk crossover masters Dirty Rotten Imbeciles at the Back Bar in San Jose, CA with our allies in Angerhead, the King Must Die, and Cultural Warfare. We’ve made some changes in the last year and can’t wait to reveal them to you. A hint: since the tragic second and final death of Zombie Orc Guitarist Hulg ElfR.I.P.per and the madness resulting from finding the Yellow Sign of former WarChief and vocalist Gogog Bloodthroat that lead to his being cursed to roam the blasted doomscape of Hirntodia chasing ghosts and demons, we’ll be introducing you to a new orc, the latest member of the Gore-Stained Axe Tribe and A Band of Orcs’ line-up to assault your frail human eardrums. Be there!